The bottom most piece of a horizontal blind. These are usually colored to match the rest of the window covering and are weighted to make sure the blinds hang straight. If your blinds have hold down brackets, the brackets are attached to the bottom rail. 2" high weights that are inserted into the hem of all free hanging fabric vertical blinds. Because fabric blinds weigh much less than their PVC counterpart, the weights are added to help the vanes hang straight. The two outside strings that hold a horizontal blind together. The braided ladder is attached at the headrail, runs through the middle of the slats, and finishes at the bottom rail. These can often be covered with decorative tapes. Designed to separate into two parts if pressure is exerted upon them. Breakaway tassels are a safety feature that prevents a child or pet from getting tangled in a hanging cord. For additional safety, use continuous cord loops and attach them to the wall with a cord tensioner or anchor. An important safety feature that prevents children and pets from getting tangled in excess, dangling cord. 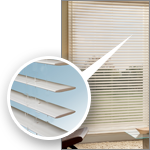 This option makes raising and lowering extra large blinds effortless. With this feature, cords remain at the same position regardless of shade position, and it also allows the shade to be stopped evenly and precisely at any height. Manufacturers refer to this feature by numerous names, including: EasyLift, EasyRise, EasyUp, EasyGlide, and PowerLift. You can usually select whether you want each control on the right or left side of your blind. Face your window, and decide if you would like them on the left or right side. Take into consideration how often you are going to use the controls and how easily accessible they are. Check to see if any furniture may be blocking areas of the window that may make it difficult to get to the controls. 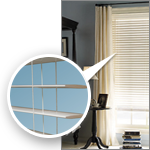 With horizontal blinds you can have both lift cords and tilt wands (or tilt cords) on the same side if your blind has a width of at least 18". Between 10" and 18" (depending on the manufacturer) your controls have to be on opposite sides. The mechanism that raises and lowers your blind or shade. Rotating this opens or closes the slats of your blind. For most blinds, this is made of plastic, but usually, wood blinds have wands made of wood doweling. Available on some blinds, and an alternative to the tilt wand. Tilt cords look similar to lift cords – consisting of two cords, pulling one tilts the slats open while pulling the other tilts the slats closed. The beaded cord forms a continuous loop which is used to raise and lower a blind. 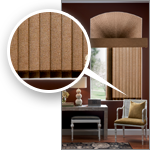 They are also used on vertical blinds for tilt control. Blind slats can be tilted from the center only. They cannot be raised or lowered. This option is only available for very narrow blinds. 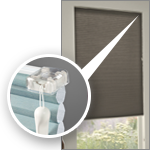 Located on or inside the headrail, a cord lock lets you lock your blind in the desired position. When the cord is pulled straight down, the blind rises and locks into place when you stop pulling the cord. The cord unlocks by pulling toward the side and allowing gravity to lower the blind. When installed properly, the cord tensioner holds looped cords taut to reduce the risk of an curious child or pet becoming entangled. 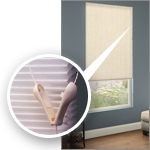 The Cordless option allows you to raise and lower your shades and blinds with just the touch of a finger. Your blind will open and close evenly, and can be stopped at any height. There are no pull cords for kids and pets to become tangled in, so this is a great safety option. 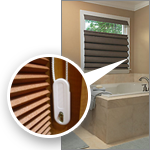 Cordless mini and wood blinds will still have a tilt wand to adjust the angle of the slats. 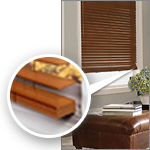 Most wood, vinyl and aluminum 2" slat horizontal blinds can be ordered with optional cloth tapes. These cloth tapes hold and tilt the slats and replace the braided ladder. Cloth tapes of various colors may be available at an additional charge. Extension brackets are used with blinds that are mounted on the outside of the window casing to allow clearance to accommodate any obstacles such as wood trim or handles that open and close windows. There is no additional charge for extension brackets. Gauge describes the thickness of an aluminum slat. 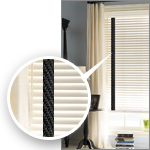 Mini blinds come in 6 gauge (.006" thickness) and 8 gauge (.008" thickness.) Thicker blinds don't bend as easily. The uppermost part of your blind, it's where the control mechanism is located and where the blind attaches to the wall or ceiling. Brackets that attaches to the bottom rail of the blind - and holds the blind in place. These are recommended if your blind is being hung on a moving surface, such as a door or a window that has wind exposure. Your blind is mounted inside the window frame. 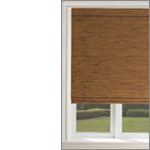 A layer of fabric that extends over the back of pleated shades, woven wood and roman shades. There are two types of liners, both give a uniform exterior appearance with a neutral color, and add additional privacy. 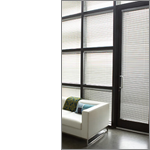 A semi-opaque white backing that allows in some light but increases privacy. Also called, Room Darkening liner. 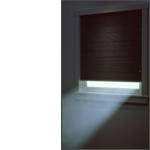 This is an opaque white backing that blocks 99% of light and provides total privacy. 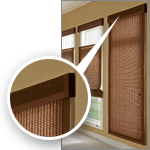 Your blind is mounted on the wall, outside the window frame. If the window frame is flat, the window covering can be mounted directly on the window frame. These options are available for roller shades. Roll is visible to someone facing the shade. Roll is invisible to someone facing the shade. These blinds don't have visible route holes when the blind is closed. 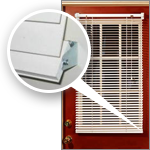 A routeless slat has no center opening and lift cord securing each slat to the blind. Instead, each slat is free hanging and easily removable. The blind is held in place by a braided ladder that cradles the front, back and bottom of the slat. 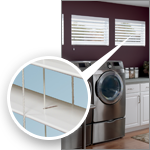 Since there is no lift cord going through the slat, they can be removed for easy cleaning. They are generally referred to as Routeless.  Each manufacturer has its own trademark for this feature. 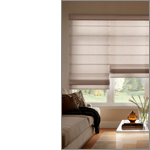 Hunter Douglas calls its "Lightline," Bali calls its "Lightblocker," and Levolor calls its "Lightmaster". Is energy efficient and offers optimal privacy as well as shielding a room from outside light. The center hole where the lift cord goes through the slats. The individual pieces of a horizontal blind that cover the window and are held together by the braided ladder. 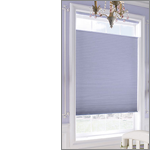 This option is available on several blind and shade types. 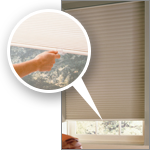 The top down/bottom up usually cords on each side of the blind, though it can be available in cordless. One cord allows the shade to be raised from the bottom up and the other cord allows the shade to be lowered from the top. This is ideal for bathrooms and rooms on the main level of your home. Some products also offer a "top down" feature, in which the shade can only be adjusted from the top while the bottom remains fixed at the window sill. 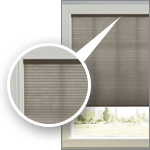 A standard feature with most blinds, the valance attaches to the top of the blind, covers the headrail, and matches the color and material of the rest of the blind. 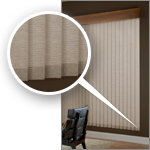 Valance options are different depending on the type of blind you are interested in. 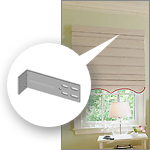 The slats of a vertical blind are called vanes. They hang vertically from the track. They can be made out of fabric, aluminum, or vinyl. 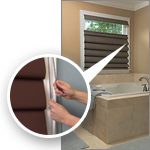 Most fabric vanes can be inserted into groovers for additional privacy and light-blocking for an additional charge. You have the choice of which direction you would like your blinds to open. When facing your window, decide how you want your blinds to open. There may be an additional charge for Reverse Draw.